Above: A portrait of my father, Spyros. Above Right: My sister, Eftsratia, and my mother, Efterpi, are working on the krevati. Above: Every year, we competed in Christofidia ( named after the Greek American who was the benefactor in building the local stadium). 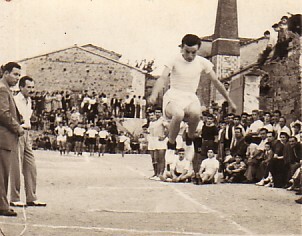 In the 1952 Christofidia, I competed in the long jump event, which I won. Above Middle: During my national service (1957-59), I served in the Greek Navy.